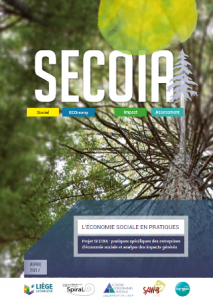 Report realised, for the Walloon Minister for the Social Economy, called SECOIA (Social ECOnomy Impact Assessment), where the management practices by social economy enterprises were evaluated according a model grid. The study was led by the University of Liège and 2 of its research centers, Social Economy Center & Spiral Research Center, SAW-B (Solidarité des Alternatives Wallonnes et Bruxelloises) and CIRIEC Belgium. After meeting a hundred ecosystem actors in Belgium, an interim report is now available. International analyses were also achieved with the help of CIRIEC-Canada, CIRIEC-Spain and CIRIEC-experts from Italia, Romania and Sweden. Thoses analyses will be integrated in the final report.